If you are looking for spare Replacement Keys, remote keys, Broken Keys extraction and many other locksmith services, we are the right solution for you. We have fully equipped mobile service vans armed with a team of locksmith professionals and latest locksmith standard equipment to ensure that you are always rescued in any car locksmith emergency. If you are stuck due to any auto locksmith in the following areas, Halifax, Brighouse, Dewsbury, Batley, Wakefield, contact us and we will send you the most qualified and experienced car key experts. It only takes our technicians less than 30 minutes to get to you and you will be back on road in less than an hour. Our services are offered at reduced rates saving you a lot of money. This makes us better than your local car dealer. We have the expertise, technology and necessary tools to offer the following locksmith services for all car makes and model. 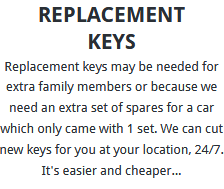 Car Replacement Keys – We cut new replacement keys from quality materials as well as remote programming for spare, stolen, damaged or Lost Keys for any of your automobile. We are experts in bus, car, pickup trucks, vans, motorcycle and other automotive keys. 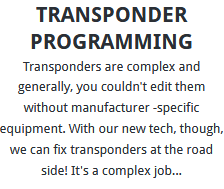 Automotive Key Programming – Our technicians are knowledgeable in Transponder Programming to enable your new key to communicate successfully with the car immobiliser system. We also reprogram malfunctioning keys to restore them back to normal operations. Give us a call now and you will be assisted within no time. 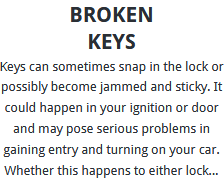 Stuck Or Broken Keys – In case you have snapped your key in the ignition, our car locksmiths will remove the broken key and replace it with a brand new one. We also remove and repair stuck keys and damaged keys. Lost Or Stolen Car Keys – The risk of missing your car keys, whether they have been stolen or lost keys there is a chance of an unauthorized person having a copy of your car key. 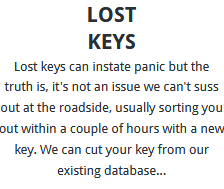 For this reason, our technicians will deactivate the lost key and programme a newly cut key for the car making it unique and the only one that can start your car. You don’t have to come to us physically. With just a phone call, we will come to you and rescue from any locksmith mess. We operated on 24-7 basis and it doesn’t matter your location or the time of the night you call. Even at 3 am in the morning, we will pick your call and respond within the shortest time possible. Our technicians you GPS enabled vans to help us find you faster. Our technicians have been trained on different car brands and models to ensure that we always have the answer for you whenever we come to you. Let our technicians serve you and you will never regret your choice. You will enjoy faster and guaranteed same day solutions when you work with Auto Locksmith Huddersfield. Call us now and have the value of your money for any locksmith services. We have been serving the Huddersfield community for many years and our quality for all locksmith services is unquestionable. Whether you own a Hyundai, Mini, Volvo, BMW, Audi or any model of any car brand, we have the right proficiency and tools to deal with all car key issues. Our auto locksmith services include broken keysand stuck keys extraction, replacement keys for spare, transponder chip and remote key programing, automotive rekeying, trunk opening among other locksmith services. Our skills, experience and exceptional customer service has made us front runners in the industry. Have you lost your keys? Do you need duplicate keys for spare? Look no further! Car Locksmith Huddersfield has all the answers for you. Speed – When you call an auto locksmith, the first worry is always how fast the technicians will take to respond at the time of need. Our technicians will get to you within 20 to 30 minutes based on your proximity to our mobile car key experts. We have technicians available 24-7 and they will always have the perfect solution for you. 2. Competence and Experience – we have hired qualified technicians, who are certified and licensed to offer a wide range of locksmith services. We have diversified locksmith skills in every team of technicians visiting you to enable us help you out in any car key issue. In addition, our key technicians are taken through a series of regular training to enlighten them on any new technology or innovation being used by different car manufacturers in making the car key. Broken keys repair and extraction. Replacement keys for all vehicles. Stolen or lost keys deactivation and replacement programming. Our technicians are masters in locksmith services regarding non-electronic and electronic keys for motorcycles, cars, vans, trucks, lorry and bus among other automobiles. 4. Modern Equipment and Tools of Work – For quality service delivery we have invested in modern and high quality tools so as to enable us to deliver quick and guaranteed solutions. Our technicians use new and GPS aided vans to help us get to your location as fast as possible. The mobile service vans are also fully armed with different tools of work including safe key extraction tools, transponder chip programming equipment and key cutting machinery. Our car key experts have the experience in working with all these tools. 5. Affordable Costs – Your local dealer charges may be way too high and you will have to wait for days to get your issues fully sorted. Save money through our quality and affordable locksmith services on the same day. Our charges have no hidden charges and they are consistent in any location, time and across customers. We have the best charges in the area and we never compromise on quality.